Connect the Drobo to your computer (mac) with the included Thunderbolt 3 cable. 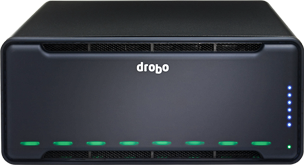 To connect your Drobo using Thunderbolt 3, connect the cable to either of the two ports with the Thunderbolt logo on the back of the Drobo. Note: If you plan to use Thunderbolt 3, it is important to verify that it is supported by the port on your computer. Not all USB Type-C ports support ThunderBolt 3. If you plan to connect your Drobo to a Thunderbolt 2 port, please purchase an “Apple Thunderbolt 3 to Thunderbolt 2 adapter” (click here) and if you need additional resources then click the Help button below. 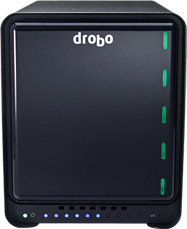 Make sure the cable is securely inserted on the back of Drobo and to the computer. Note: in order to Daisy Chain 2x 4k monitors a 40Gb/s Thunderbolt cable is required. 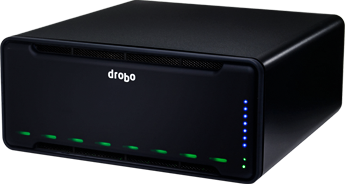 Connecting the Drobo to a computer with Thunderbolt 2 will require an Apple adapter. To purchase the adapter Click Here. Note: This adapter only works on Macs running macOS Sierra or later.